Experienced financial executive with 20 years in the Chief Financial Officer role at companies with revenues from $2M to $150M. Diverse experience across manufacturing, professional services, nonprofit, and technology verticals. Strategic partner to CEOs, able to provide effective financial leadership to companies in various phases ranging from startups to 500-800% per year high-growth environments. Tom’s focus is on lowering costs and improving cash flow by internal process improvement and the use of well-structured financing options. He excels as a negotiator and has successfully negotiated many debt agreements and managed the financial aspects of several securitizations and private placements. Tom also has experience as a CIO and has led significant IT initiatives including a large implementation of PCs and development of a new cost system in an MRP environment. As a consultant, he has worked with many smaller businesses to develop business plans, financial projections, and strategies for managing growth and attracting investors as well as assisting nonprofits to develop accurate, actionable financial statements while focusing on planning and liquidity improvement. 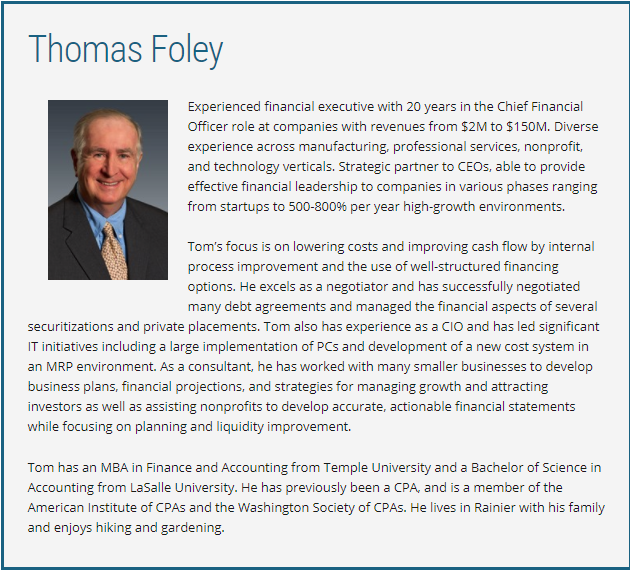 Tom has an MBA in Finance and Accounting from Temple University and a Bachelor of Science in Accounting from LaSalle University. 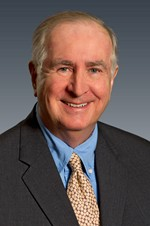 He has previously been a CPA, and is a member of the American Institute of CPAs and the Washington Society of CPAs. He lives in Rainier with his family and enjoys hiking and gardening.